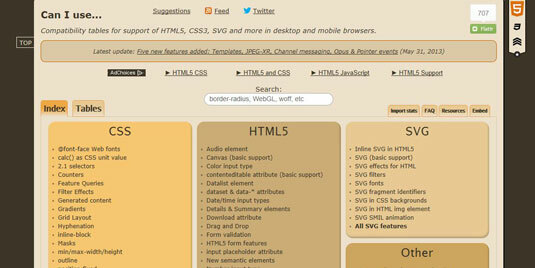 HTML5 Rocks is a Google website that regularly publishes articles about HTML5. HTML5 Rocks also contains great references and demonstrations of the latest HTML5 technologies and standards. Can I Use is the HTML5 developer's best friend. Can I Use has complete and up-to-date compatibility tables for HTML5 and CSS3 — showing not only which browsers support which features, but what version the feature became supported in. If a browser doesn’t yet support a feature, CanIUse.com will tell you if support for that feature is coming soon. 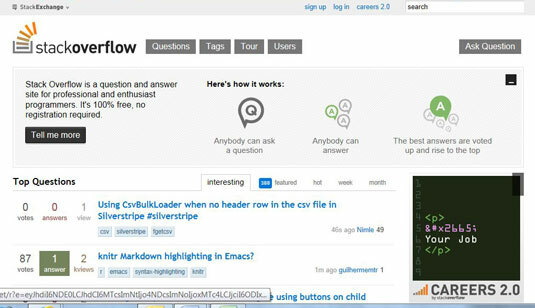 StackOverFlow is a giant — and free — question and answer site for programmers. If you’re stuck with an HTML5 or CSS3 problem, chances are good that someone has had the same issue. And, in the awesome spirit of the web, chances are good that programmers with questions received multiple answers and solutions to their problem at StackOverFlow. Answering questions on StackOverFlow is a great way to learn a new skill too. Web Platform Docs is a community-driven site which aims to become the comprehensive and authoritative resource for how-to information and documentation for web developers. Web Platform Docs has a large (and growing) community and has the backing and support of the web’s biggest players, including Facebook, Google, Microsoft, Adobe, Mozilla, Intel and more. The Mozilla Developer Network is a giant repository of web development references and articles created by volunteers. The Mozilla Developer Network is associated with Mozilla, the non-profit organization that created and maintains the Firefox web browser. The World Wide Web Consortium, W3C, is a great source of information, tutorials, and tools. The World Wide Web Consortium also is the fountain whence HTML, XML, XHTML, CSS, and a whole lot more springs. A List Apart Magazine has great content (and ideas for aspiring web designers and developers) to share. Lots of full-time, professional developers, designers, architects, and project managers are active on A List Apart Magazine. 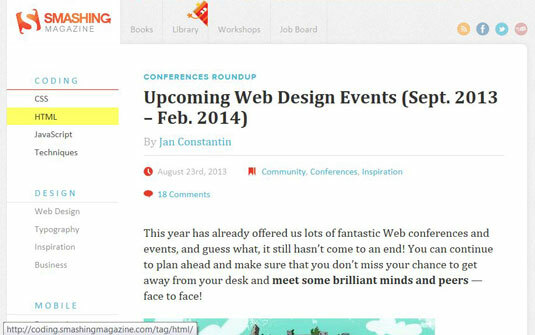 Smashing Magazine aims its coverage squarely at web designers and developers. Smashing Magazine seeks to keep them abreast of the latest trends, tools, and techniques related to their design and development interests. Noupe is a web-based magazine that targets web designers and developers. CSS-Tricks is "curated" by über web (and CSS) geek Chris Coyier.